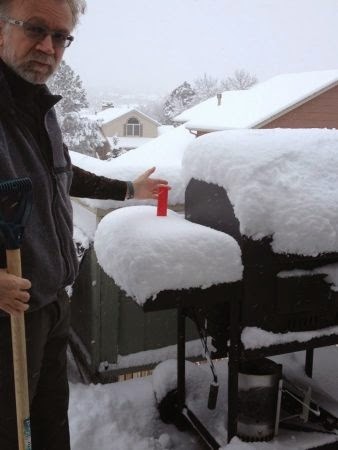 Just so you know I'm not making this up, here is a photo of the DH holding a ruler in our 8" of new snow this morning. I know we need the moisture, but this is ridiculous! 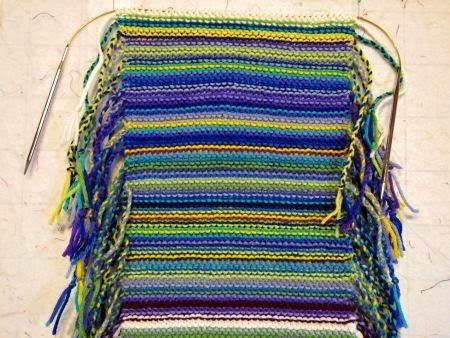 Here is the "My Year in Temperatures" scarf. It's getting to where you can see the temperature trends -- no pinks in March. Here's a close-up of the March rows. More greens and yellows toward the end of the month. 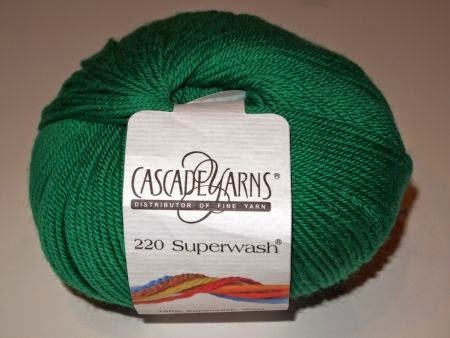 I know I can get Cascade 220 Superwash at Table Rock Llamas, but I needed this bright green to match my Sephora nail polish. This is Gobelin from Biscotte & Cie. 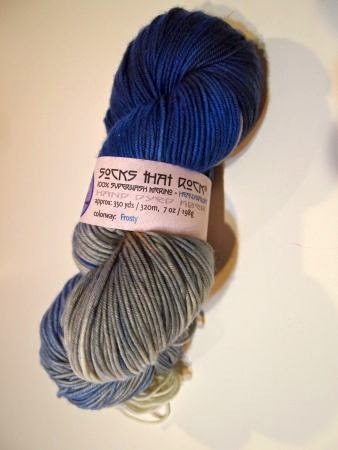 Yes, is's 100% superwash merino -- the color is Poisson Tang. Literally, it means "tang fish," but I'm sure it means something else. Maybe a follower who speaks French can help? This is DK weight, from Skein Yarn in Australia. This is a new company to me, so even though the yarn is lighter weight than I would usually use for Hats for Sailors, I wanted to try it. Again, 100% superwash merino. 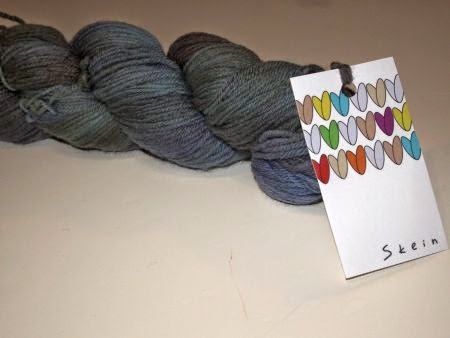 Can't go wrong with Lorna's Laces Shepherd Worsted. I wanted an unusual-for-me color, and isn't this mint green sumptuous? 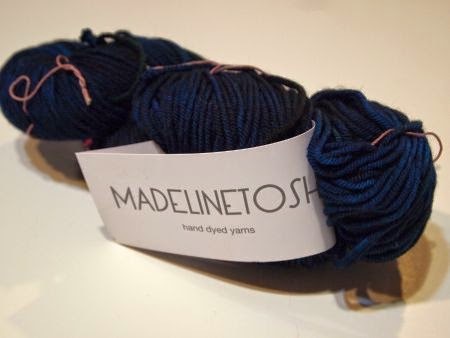 I've used a lot of Madelinetosh DK weight, but this is worsted weight Tosh Vintage. The color is called "Stargazing." Reminds me of friend Mary and me looking up at the stars from outside her cabin in Colorado -- until she mentioned the mountain lion she had seen earlier in the week. We stargazed from inside after that. 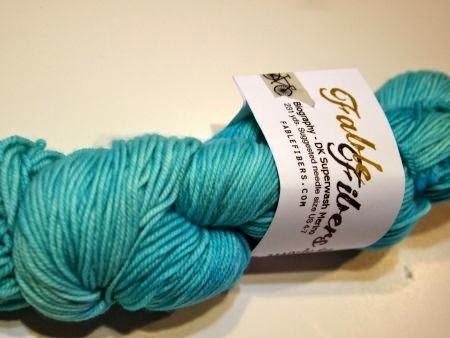 This pretty is from another new-to-me company, Fable Fibers in Charlotte NC. One of my Knitter Buddies now lives in Charlotte, I think -- right Diana B? Hmm, maybe a personal shopper in the works? 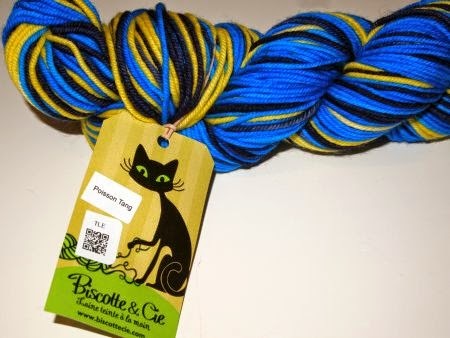 I'm a long-time Blue Moon Fiber Arts fan, but haven't used much of their yarn since I stopped knitting socks. I didn't realize their "Socks that Rock" heavyweight is "almost" worsted weight. 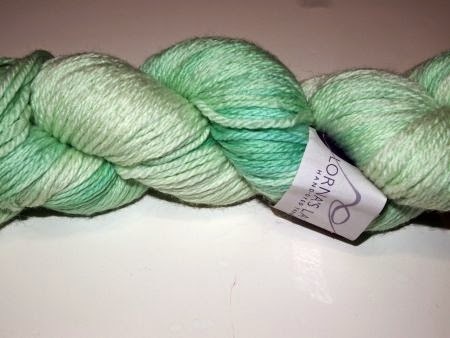 This colorway is called "Frosty," and the hank has 350 yards. That's enough for three hats! With our April snow, it's a perfect day to curl up and knit Hats for Sailors. 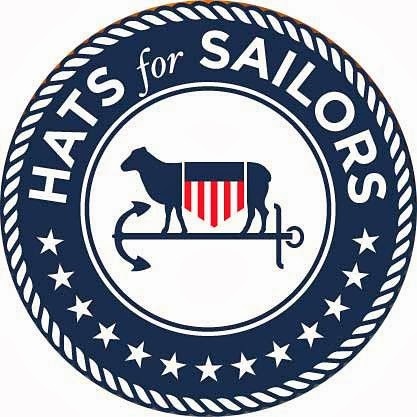 Go here for the detes, and I hope you will consider knitting a hat for a sailor, too! Good to see one Aussie lot in there! Personally I love the Poisson Tang or the variegated mint green....It would be interesting to know where the wool is from originally. Looks a bit nippy over there. Hopefully its a last flourish before your warmer weather. We had a last flourish of summer on the 1st here, 37 degrees in April. The nice thing about warm weather at this time of year, it still gets cooler at night so not as overwhelming as January heat! Lovely woolly goodies there, I haven't knitted anything for years, too busy quilting now! toujours surprise par le travail que vous faites et j'admire les photos de votre pays et sous la neige aujourd'hui ..souvenir de france.liliane Dupré . Diana, I am so excited to add a "pin" to my "readers" map for Botswana! You probably get tired of people saying "Oh, I read Alexander McCall Smith's books," but that is the only reason I have a clue where Botswana is. 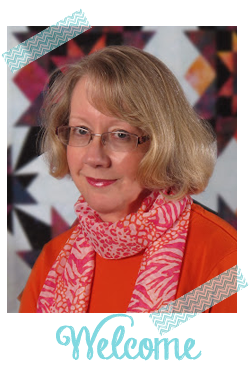 Thanks so much for commenting, and for following 52 Quilts! Love all the yarns. The teal one is my fav. Hopefully by now the snow is gone and spring has arrived.